In the waning hours of 2017, the Federal Communications Commission voted to repeal the 2015 Open Internet Order, ending net neutrality protections for the millions of Americans who support them. The fallout of that decision continued all throughout 2018, with attempts to reverse the FCC in Congress, new state laws and governor executive orders written to secure state-level protections, court cases, and ever-increasing evidence that a world without the Open Internet Order is simply a worse one. The story surrounding net neutrality has always been one of the greed of the largest Internet Service Providers (ISPs) versus the desires of the majority of people, the actual way the Internet is structured, and the ideal of a free and open Internet. Every win this year represented a win by actual people speaking out over big ISP money. The so-called “Restoring Internet Freedom Order” didn’t go into effect until June 11, 2018, but states started preparing for the FCC’s abdication of oversight over the Internet early on. State leaders immediately committed before the ink was dry to stand up for net neutrality. A net neutrality bill, S.B. 822 was introduced the very first day of the California legislative session. Governor Bullock of Montana issued his Executive Order only weeks later in January. 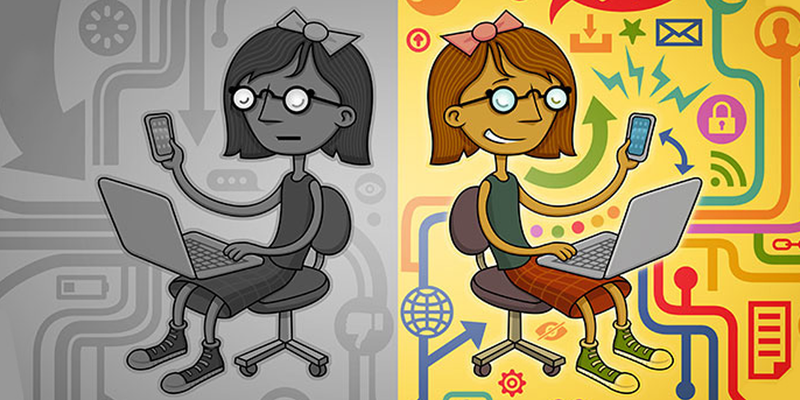 By March, Washington’s state legislature had overwhelmingly passed net neutrality legislation to the Governor. In April, Oregon signed into law H.B. 4155, which required any ISP getting money from the state to adhere to net neutrality principals. California’s S.B. 822 turned out to be a particularly contentious battle, as that was the strongest bill moving this year. After passing in the California Senate, a state Assembly hearing gutted it, removing the strong protections that made the bill a net neutrality gold standard. But Californians spoke out en masse and a potent coalition of fire fighters, college students, startups, local ISPs, public interest advocates, and low-income advocates made clear the support a free and open Internet has. As a result, the final bill retained the ban blocking, throttling, and paid prioritization—paid prioritization has been a particular target of misleading ISP arguments. The ban on certain kinds of zero rating—the kinds that lead consumers to services that ISPs want them to use rather than giving them choices—also remained. And so did the ban on access fees, which means ISPs will not be able to get around these protections by charging fees at the places where data enters their networks. The result was a bill that passed with bipartisan support and was signed by Governor Jerry Brown in September. By the end of 2018, six states—Hawaii, New Jersey, New York, Montana, Rhode Island, and Vermont—had executive orders preventing the state from contracting with ISPs that didn’t adhere to net neutrality principles. Four—the aforementioned Oregon, California, and Washington, as well as Vermont —had net neutrality laws. Every time the opportunity arose a bipartisan group of lawmakers voted in favor of net neutrality. Almost immediately after California’s law was signed, the state was sued by the federal government along with the major ISPs that supported the repeal. The FCC in an attempt to keep any states from daring to step in to the vacuum it created when it repealed the Open Internet Order, had included language in the “Restoring Internet Freedom Order” that “preempted” states from writing net neutrality laws. EFF and other legal experts contend that when the FCC gave up its authority to regulate net neutrality, it also gave up the authority to tell the states what to do in that field. Because the fundamental question of whether it is even legal for the FCC to preempt states in such a way, California agreed to put enacting S.B. 822 on hold until the D.C. Circuit case is resolved. The preemption effort after all was in response to a last minute ask by Verizon and other wireless industry players and even asked the FCC to block state privacy laws. Nothing in the federal law has any statutory language that authorizes the FCC to block state action. The central case, Mozilla Corporation versus the FCC, also began this year. Mozilla, Vimeo, twenty-two states and the District of Columbia have sued the FCC, as the FCC’s “Restoring Internet Freedom Order” was based on the FCC being simply wrong about how the Internet works and because the FCC failed to adequately consider all the things it is legally required to do, the order is “arbitrary and capricious” and therefore not valid. EFF filed an amicus brief in this case on behalf of 130 technologists who helped develop core Internet technologies. In this brief we explained the ways that the “Restoring Internet Freedom Order” mischaracterized how broadband Internet access service works; for example, the FCC claimed that because you can download movies using your broadband connection, your ISP is actually the entity responsible for providing those movies—not Youtube or Netflix or whatever video provider actually hosts the movies. We also explained the importance of net neutrality to speech and innovation. We’ll be watching to see if the FCC repeats these false conclusions about the Internet when the case continues in 2019. Throughout 2018 there remained the possibility that Congress could overturn the FCC’s decision. The Congressional Review Act (CRA) allows a simple majority vote by Congress to overturn an agency order, provided the vote happens soon after the order is published. In May, the Senate reflected the will of the 86% of Americans who support net neutrality by voting 52-47 for the CRA. It remained for the House of Representatives to follow suit, but although 180 Representatives signed the Discharge Petition calling for the vote before the end of the year, they didn’t get the majority of 218 required to get there. That said, next year’s Congress could still pass net neutrality legislation that overturns the FCC, just in a different form. We will also have to be vigilant as major ISPs push for their own fake net neutrality bills through their allies in Congress. Undoubtedly they have realized that absent convincing Congress to delete non-discrimination from the Communications Act, their days of pushing an anti-net neutrality agenda in complete defiance of the American public will eventually come to an end. 2018 kept illuminating ways the 2015 Open Internet Order protected users beyond just net neutrality rules but in areas of public safety and competition. In August it was revealed that Verizon had throttled the Santa Clara fire department’s “unlimited” service during a wildfire. In the midst of trying to fight the Mendocino Complex Fire, Santa Clara’s fire department found its Verizon Internet slowing to dial-up speeds, and when it called Verizon to ask what was going on, Verizon told them to switch to a plan that cost twice as much. The 2015 Open Internet Order would have let the FCC investigate Verizon’s actions in this situation and if necessary to use its power to remedy the situation in the future, but, instead, an overburdened and limited in power FTC is left and likely cannot penalize Verizon for conduct the company itself admits full fault. The service outages in Florida (some that may still be present today) following the hurricanes likewise reminded the world that a FCC with no authority over broadband companies is reduced to issuing press releases asking them to treat people better. Both of these situations show that a post-Open Internet Order world is having problems resolving issues relating to public safety. That makes sense, since public safety is the role of the government and maximizing profit is the concern of companies. Fortunately, 2018 didn’t see a sudden avalanche of countries joining the United States’ approach of abandoning net neutrality. South Korea contemplated following suit and abandoning net neutrality in light of the FCC action at the behest of their ISPs. EFF testified before the parliament to explain the level of opposition American regulators were facing from the public as well as the dire competitive situation United States broadband market faces due to a lack of fiber to the home competition (a problem completely unheard of in South Korea). In light of the local circumstances surrounding what is arguably the biggest mistake in Internet policy history, from the national protests to the fire department being unjustly throttled, the South Korean parliament decided to stick with net neutrality. 2018 proved just how important the 2015 Open Internet Order was to protecting net neutrality. It showed states and the Senate stepping up to try to rectify the FCC’s decision. And it started the court battles that will decide the future of the free and open Internet.